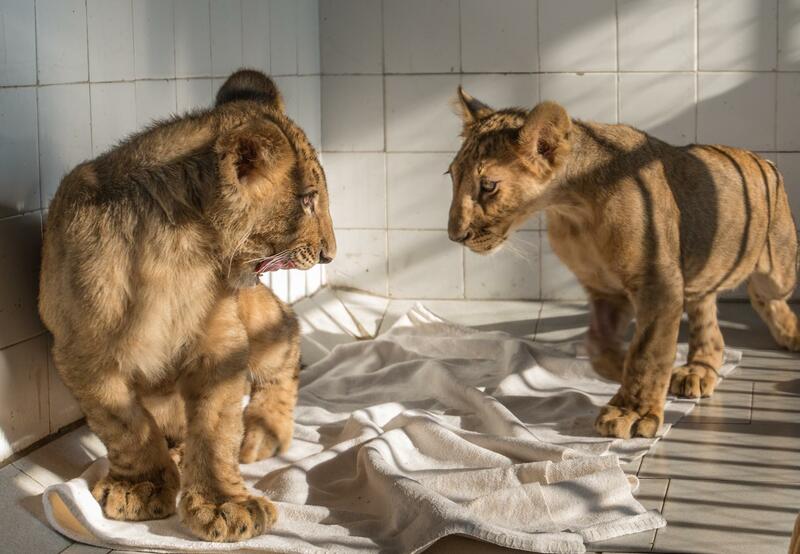 FEBRUARY 8, 2018– Today, a new life begins for the two Bulgarian lion cubs named Masoud and Terez. Their journey began in Bulgaria and took two days of driving through Romania, Hungry, Austria and Germany to the Netherlands. There, the cubs are to stay at the Big Cat Centre FELIDA, a sanctuary run by FOUR PAWS the international animal welfare organization. A FOUR PAWS team was also responsible for the transfer under the watchful eye of wildlife veterinarians. Masoud and Terez were born into a dire situation at the Razgrad Zoo in Bulgaria. FOUR PAWS was first asked to assess the situation at the dilapidated private zoo back in October of 2017. They have since rescued two twelve-year-old lions Raya and Hector in December along with one other lion. Razgrad Zoo opened in 1960 and is located in north-eastern Bulgaria. Although its license expired in 2014, the zoo remains open to visitors for free, and is financed by the unprofessional breeding and sale of lions. Currently, many animals of different species – including lions, deer, reindeer, llamas, foxes, hogs and birds – live in the illegal zoo. Since the city owns the zoo, FOUR PAWS convinced the mayor of Razgrad to intervene. At the end of last year, an international team of veterinarians provided medical care to all seven lions and sterilized two adult males. Due to the reluctance of local authorities to hand the lion cubs over to the care of FOUR PAWS, the on-site team was confronted with a tense situation given the serious health conditions of the cubs. After public protest against the transfer of the cubs to another substandard zoo, FOUR PAWS eventually gained permission to transfer the cubs over a week later. As the FOUR PAWS team on-site in Bulgaria was waiting and campaigning relentlessly for the necessary permissions to transfer the lion cubs, Dr. Marc Gölkel from the Leibniz Institute for Zoo and Wildlife Research (IZW) performed a veterinary check on both cubs. The results showed that Terez has a serious bone growth defect in his front legs that needed specialized care, which FOUR PAWS can provide. Such a defect is most likely a result of the unprofessional breeding practices in the Razgrad Zoo, as Masoud and Terez are from at least the second generation of an inbred line. Fortunately, thanks to the support of the Bulgarian prime minister as well as the tireless efforts of the Bulgarian public, the permissions to transfer the cubs were eventually granted. The FOUR PAWS team did not waste any time and was on their way to the Netherlands as quickly as possible. Three-year-old lion Ivan-Asen, also rescued from the Razgrad Zoo, will stay at the Sofia Zoo for now. He reacted very well to the treatment he received there and, according to the veterinary checks, is healthy. FOUR PAWS has definite plans to transfer him to the Big Cat Centre FELIDA too as the municipality of Razgrad has already entrusted the animal welfare organization with the care of Ivan-Asen. "We are very happy that the situation took a positive turn and that we could bring Masoud and Terez to species-appropriate surroundings. Given Terez' health condition, he urgently needs daily monitoring and a special diet to treat his poor development. From now on, they can recover from their past suffering." The lion cubs will live, for the time-being, at FELIDA Big Cat Centre, which is located in the Dutch town of Nijeberkoop. By taking over the project in 2014, the international animal welfare organization also assumed responsibility for the 26 big cats that were already housed there. As FELIDA was primarily intended to serve as a transit and rehabilitation center, FOUR PAWS has moved most of the wild animals to the FOUR PAWS Big Cat Sanctuary LIONSROCK in South Africa. However, the current cats are too old or weak to be transferred. Six other tigers, including the two young tigers FOUR PAWS rescued from Syria, live at the Centre. In the future, FOUR PAWS plans to relocate the facility so that even more big cats can be rescued from poor keeping conditions and placed into large close-to-nature enclosures. Now, Masoud and Terez have found a new home where they can recover from their past suffering. The team at Big Cat Centre FELIDA will provide them with the care they need and prepare them for a final transfer to an even larger sanctuary in the future.